With a private terrace and an à la carte restaurant, Hôtel Le Cardinal is located just a 5-minute walk from both the Moulin Rouge and the Casino de Paris Music Hall. A continental breakfast made with fresh, local produce is prepared daily. 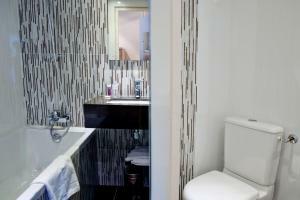 A flat-screen TV, telephone and minibar are featured in the traditionally-decorated guest rooms. 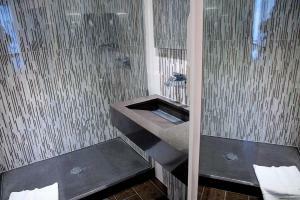 Free Wi-Fi access is available and the private bathroom is fitted with either a bath or shower. Traditional French cuisine is served in the hotel’s restaurant from Monday to Friday. Cocktails, wines and spirits can be enjoyed in the bar. Liège Metro Station, 400 metres away, provides direct access to the Champs Elysées. The Sacré-Coeur Basilica is 1.5 km away and the Opera Garnier is only 1 km from the hotel. Place de Clichy Metro Station (Line 13) is just 500 metres away and it gives direct access to the Stade de France, which is 1.5 km away. 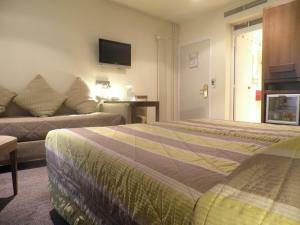 This double room features a minibar, a flat-screen TV and air conditioning. Rate: € 113.71 ... € 320.29; select dates below to get current rates. 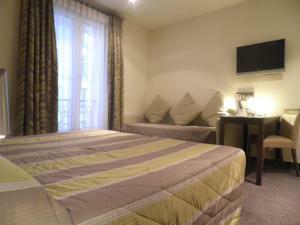 This double room features a flat-screen TV, air conditioning and a minibar. A flat-screen TV, air conditioning and a minibar are provided. This room features a minibar, a flat-screen TV and air conditioning. 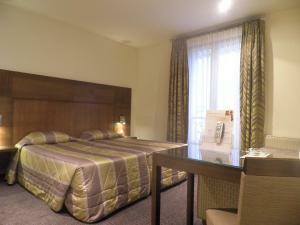 Rate: € 79.00 ... € 362.00; select dates below to get current rates. This family room features a soundproofing, air conditioning and minibar.